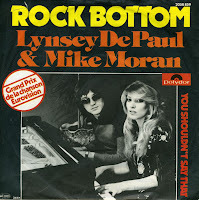 Mike Moran (born March 4, 1948) and Lynsey De Paul (born June 11, 1960) wrote the song 'Rock bottom' together and also got to perform it together on the 1977 Eurovision Song Contest, representing the United Kingdom. Although the song was in the lead when the juries started giving their points, the song finally came second, behind the winning song 'L'oiseau et l'enfant'. De Paul and Moran went on to write a number of songs such as 'Let your body go downtown', a UK top 40 hit for the Martyn Ford Orchestra and the follow up 'Going to a disco' as well as the songs 'Without you' and 'Now and then'. Moran was also a wellknown songwriter in his own right, co-writing Freddie Mercury's 'Barcelona'.